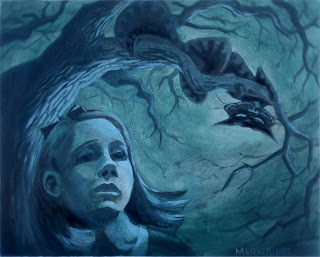 This is an acrylic painting of Alice right before she meets the Cheshire cat. We were supposed to only use one color with black and white. Can you guess what color I picked. I was pretty happy with this one. It was the first acrylic painting that I wasn't totally frustrated with. *Special thanks to Lindsay for posing for me.